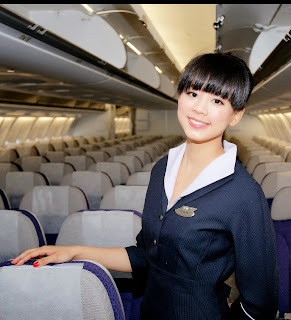 [Super Adrian Me, Singapore, 1 AUG 2012] Taiwanese full service airline TransAsia Airways launched a new set of uniforms designed by Taiwanese fashion designer, Yin Pei Gun, for over 500 cabin crew and ground staff for all its routes. This is the first new uniform design introduced in over 10 years. Mr Yin gained his reputation while working with SHIATZY, a Taiwanese high fashion brand. Mr Yin was influenced by the fashion trend of the 50s which is also when TransAsia Airways was first established. The new uniforms reinforce the passion and belief up which the airline was founded. The uniforms were designed to achieve both functionality and design. The trench coats for cabin crew were made of shape-memory fabrics while the aircraft maintenance staff had a finishing which provides additional protecion and comfort. The dark blue uniforms with purple stripes reflect TransAsia Airway’s corporate colours while the male uniforms came with a silk tie that had its logo on it. TransAsia Airways operates daily flights between Taipei and Singapore on its 150-seat Airbus A320. GE888 departs Singapore at 7.20am and arrives in Taipei at 12.15pm while Ge887 departs Taipei at 7.20pm and lands in Singapore at 11.45pm. How beautiful new uniforms. If you want to own beautiful uniforms at very favorable prices, GLU Uniforms is a garment company that can meet all requirements of uniforms, t-shirts, backpacks and hats.